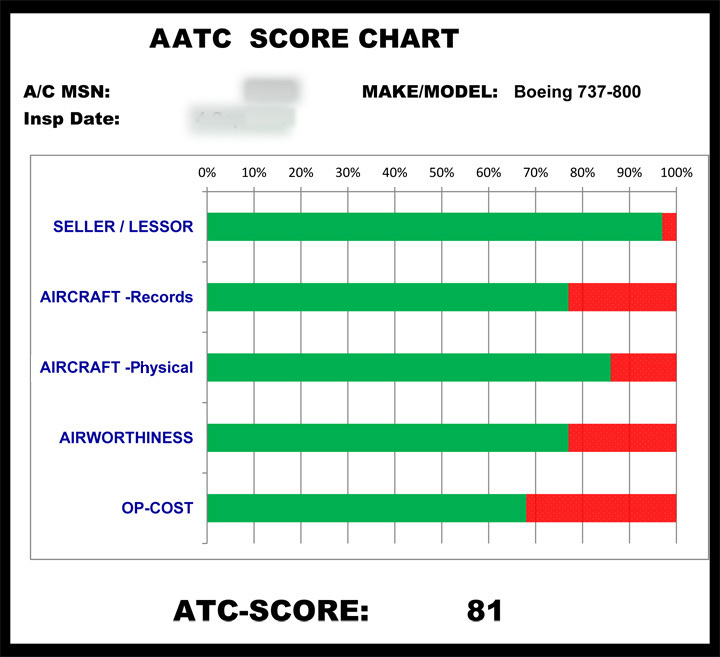 Overall ATC ranking in this area is based on the integrity of the Seller/Lessor/Owner in respect to their credibility, market presence, fleet size, fleet age, team management experience, any known complaints on past transactions, documented litigation or breaches of financial responsibility. This in-depth research is generally performed using open sources, including online material, industry news and social media exchanges, as well as contacting current and previous business partners and clients. Added to this information is any relevant input from industry insiders. Aircraft with missing or questionable records can effectively be classified as total loss or scrap. Proper management and record keeping of an aircraft’s current and historical maintenance is an essential basis of this ranking. A high number of previous operators may indicate inconsistent record keeping. Operational tracking of maintenance tasks, speed of access to specific data, tracing of Life-Limited Parts (LLP) and presentation of records for possible regulatory audit all influence the “Records” grade given to an aircraft. Has the aircraft been operated and maintained in accordance with its manufacturer’s instructions for continued airworthiness? Topics that influence this ranking include age of aircraft, number of structural repairs, engines’ Time Since Overhaul (TSO) and remaining LLPs, known accident/incident history such as hard landings, exterior/interior wear and tear, cockpit condition, installed avionics, and overall airframe condition. This particular grade is all based on FAA standards and regulations in respect to aircraft airworthiness. Typically, minimum airworthiness requirements are a reality for any serviceable or operational aircraft with an Airworthiness Certificate. History is full of examples of aircraft being purchased with its new owner unable to obtain a Standard (or Export) Airworthiness Certificate. ATC’s seasoned inspectors can recognize potential airworthiness issues by reviewing the aircraft historical records supplemented by additional research using the FAA database. This ranking also shows how much of current airworthiness may be in the gray area–even though acceptable to the FAA–through spot checks of maintenance records. When selecting an aircraft for purchase or dry-lease, Operating Cost is a serious concern. This area looks at the current condition of the aircraft, its maintenance status, operational limitations and other factors that may cause higher-than-expected operating costs. Also considered are sooner-than-expected maintenance items coming due, lack of upgraded avionics allowing preferred or direct routes, higher-than-normal operational empty weight, and similar factors. For your next aircraft acquisition initial Level-I inspections, please Contact Us.